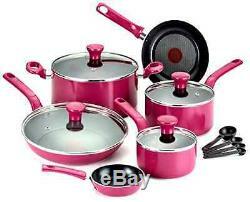 The T-Fall excite non-stick cookware set is a lifestyle range that offers vibrant, on trend colors. It has a sturdy construction and is extremely durable. The unique T-fall thermo-spot heat indicator (fry pans only) shows when T-fall pan is perfectly preheated to seal in the flavor of your food. The even heat base allows for even heat distribution for reliable cooking results. The T-fall excite cookware has a non-stick interior that is scratch resistant making cooking and cleaning easy. Ergonomically designed handles are color-matched and oven-safe up to 350 degrees, allowing for an easy transition from stove-top to oven. This 14-piece set includes a one egg wonder pan, 8-inch fry pan, 10.25-inch Fry pan with lid, 1-quart and 2-quart sauce pans with lids, 5-quart Dutch oven with lid, 4 measuring spoons. Thermo-Spot heat indicator on fry pans show when the pan is perfectly preheated to seal in the flavor of food. Expert non-stick interior is exceptionally durable and scratch resistant. Innovative inscribed base design provides even heat distribution and cooking fun. Color-Matched, lacquered handles are oven safe up to 350 degree f. The item "Cookware Set Fry Pans Pot Cooker NonStick Frying Skillet Measuring Spoon Pink" is in sale since Monday, March 28, 2016. This item is in the category "Home & Garden\Kitchen, Dining & Bar\Cookware". The seller is "aronkorn" and is located in Spring Valley, New York. This item can be shipped to United States, Canada, United Kingdom, Denmark, Romania, Slovakia, Bulgaria, Czech republic, Finland, Hungary, Latvia, Lithuania, Malta, Estonia, Australia, Greece, Portugal, Cyprus, Slovenia, Japan, Sweden, South Korea, Indonesia, Taiwan, South africa, Thailand, Belgium, France, Hong Kong, Ireland, Netherlands, Poland, Spain, Italy, Germany, Austria, Russian federation, Israel, Mexico, New Zealand, Philippines, Singapore, Switzerland, Norway, Saudi arabia, Ukraine, United arab emirates, Qatar, Kuwait, Bahrain, Croatia, Malaysia, Brazil, Chile, Colombia, Costa rica, Dominican republic, Panama, Trinidad and tobago, Guatemala, El salvador, Honduras, Jamaica.